so i got talked out of the beast 3d, and into the 300 3d today. I'm not sure if that was good or not yet (lol) but I'm hoping ill still learn easily or at least a lot on it. hoping you guys have some tips before i officially maiden it monday! unless the wind is unusually calm this weekend. i tried to hover it for a few seconds (5 tops) in my room when i get home (got to love that new plane excitement) figured i would quit before i broke it. lol, anyhow, i have it on my dx5e so no expo and i can't afford a better tx so this is what i have to work with. anyhow, hoping for tips, and luck haha! You are going to love that plane. I was flying an ultra micro 4 site at the time when my friends both got these. I flew it and oh man was it nice. It makes a good pilot look great. Excellent plane. Don't know about not having expos though. I would be really careful with it for a while until you get used to it. I can tell you it's a lot more durable than it looks. LMAO, that's what they're for lol. I learned to hover at the expense of my UM 4Site. It was a great plane. 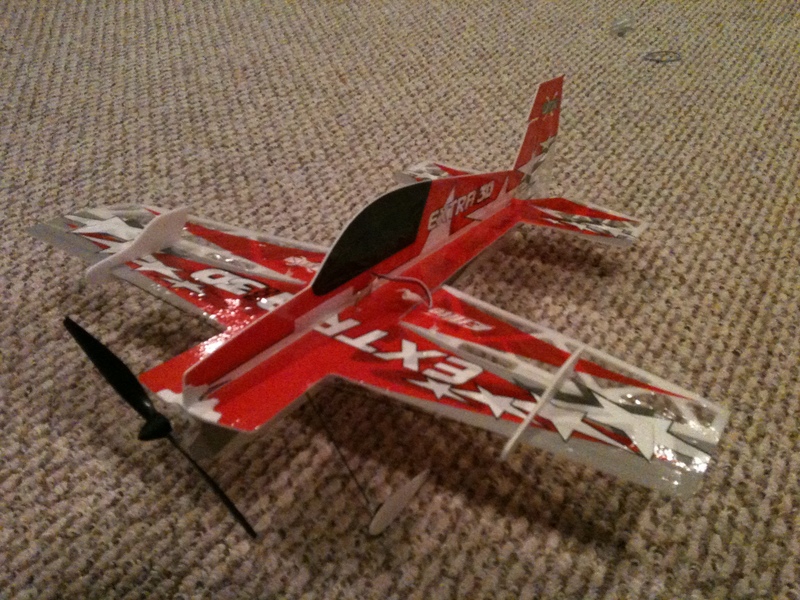 I tried a lot of things with it that I would never have tried with a bigger plane. I built the confidence to try all kinds of new things with that plane. It was very durable too and easy to repair for quite a while, but eventually it died. You can see from that video just how fast they are and how fast they roll. You really need to be smooth with them and use the low rates for a while. I had all kinds of expo dialed in when I flew on high rates. I have the DX8 so I was able to use my flight mode switch to have different settings at my fingertips. I would have it dialed down for take off and warm up, then when I felt comfortable I would flip it to high rates and expos for some crazy fun. You will still have a blast with a DX5e but it's a lot more sensitive. Honestly the Extra 300's a way better plane than my 4Site for a new pilot though. There's plenty of room in the gym! We have inservice Monday, so there shouldn't be any basketball to worry about. I'm excited to see it fly! heres a (terrible) video of me attempting hovers in my bedroom... its mot pretty and i have an odd laugh so please ignore me haha! JK man, nice hover at the beginning! Cool, you will love it in the gym. The CP+ is not a good heli to learn with. If you want to learn helis, start with an MSR. It's great to learn on, you can fly it in the living room and it will still help prepare you for your CP+. I bought the MSR and found that once I mastered fast forward flight with it, it translated straight over to my 400. Hovering is different because of the self correcting nature of the MSR. Now, the MSRX is new and flybarless, and according to the videos on Horizon Hobby, it is more like the CP helis and doesn't have that self correcting nature of the original. Supposedly it's more like a big heli and it's even capable of doing loops. I would look into that one if I were starting again. that sounds good. i hear a lot about the big helis being super stable, is it completely stupid to go big (400 size electric) as a restart or am i just being retarded and getting in over my head like usual? Well, bigger flies better alright, but a 400 doesn't really fit that bill. A 500 600 or 700 would be more stable. I've been told again and again by pretty advanced pilots that if you can fly a 450 then you can fly anything. That's because they are so twitchy and fast. Anything but stable. If you are just starting or getting back into it after a long time, I would stay away from the 400's because of the cost involved. Every crash is 50 bucks. Spend some money on a good simulator (I highly recommend Phoenix) and it will pay for itself ten fold. If you are relearning, that might do it. If you are learning for the first time, I would say go with something like and MSR or SR, something designed to be more tame. If you can hover a CP+, then the SR would probably be the way to go. The great thing about the MSR though, is how tough and durable they are. I crashed countless times and never broke anything. It wasn't until I started flying at full speed doing figure eights around the gym that I started crashing really hard and it still took a lot before anything broke. It's really up to you, your skill, your comfort level, your pocket book. Before jumping any one direction I would do a lot of research and ask a lot of questions. The videos on Horizonhobby.com are really good. Every heli has a video and they tell you who they are geared for. I keep talking about the Blade line only because that's what I'm familiar with and they are really geared towards new pilots as well as advanced.